Are you ready for New Year’s Eve 2018? Start your year doing something memorable. 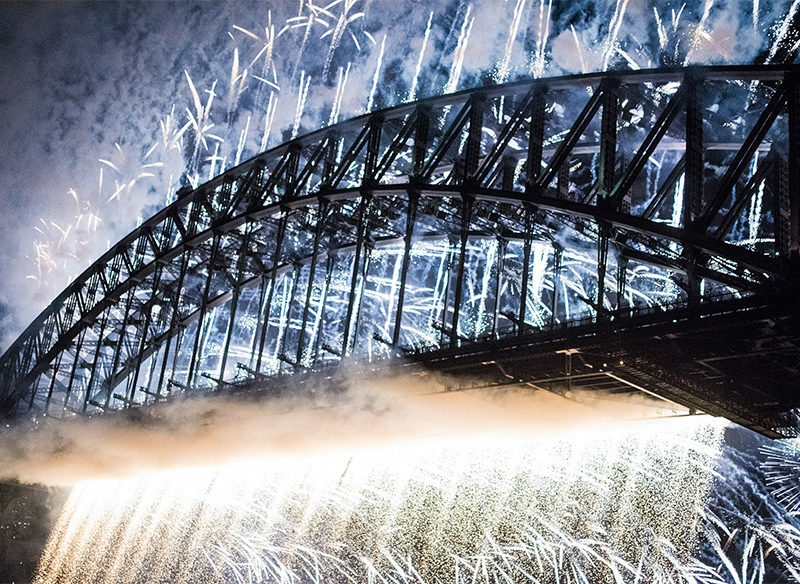 Here are some ultra fabulous ways to welcome in 2019 wherever you are across Australia. As far a NYE views go, uninterrupted ones of Sydney Harbour Bridge and the world renowned New Year’s Eve Fireworks are pretty up there. For only $499, the all-inclusive ticket will give party goers access to all you can eat street-food style stalls and drinks all night from the selection of pop up bars. With some of Sydney’s best live acts providing the soundtrack to your night, NYE @ Pier One Party is going to be the party to end all parties. Start 2018 relaxing onboard exclusive expedition ship True North. True North takes a Sydney Harbour New Year’s Eve cruise to the next level. The four-night New Year’s Eve journey will explore some of Sydney’s most peaceful spots such as Pittwater and Maitland Bay, Ku-ring-gai Chase National Park and Cowan Creek, with beach barbecues and scenic flights thrown in for good measure. 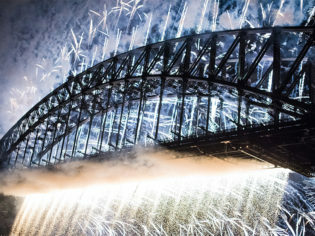 And the big event, Sydney’s midnight fireworks, can be viewed from one of the best vantage points in the city. Not many can boast about flying over Antarctica. Even fewer can say they did it while drinking champagne and listening to a live jazz band as the clock strikes midnight on New Year’s Eve. Welcome 2018 as you fly over mountains, glaciers, ice plateaus and icy coastline in broad daylight. Escape the crowds: what about an Antarctica Scenic Flight on New Year’s Eve (ex-Melbourne). The flight departs Melbourne at 5:30pm NYE, returning at 6am the following day. From $1199 including dinner, breakfast and bar service. Broome is known for its stunning sunsets, so where better to farewell the last light of 2017 than Cable Beach Club? The much-loved resort is hosting a White Party at its Sunset Bar & Grill with a DJ playing tunes into the night, plus canapés, substantial bites, a dessert buffet, late night snacks, cocktails and premium wine and beer. Dress in white and enjoy the balmy Broome weather as you countdown to midnight on famous Cable Beach. $180 per person, all-inclusive. Glowsticks, white t-shirts views…what more could you want? low sticks and white shirts are recommended, with UV paint provided for those brave enough. Advanced tickets are $25 per person. Just one hour’s drive from Sydney’s city centre lies 1200 hectares of lush bushland known as Glenworth Valley. Here, over four days and three nights, the best of glamping, music, food and meditation will merge together for a sustainable, luxurious and enlightening experiential event. Lose yourself in a forest disco and escape the big city life in the stunning Glenworth Valley this New Years Eve. Held over four days, this is the 5th year of Australia’s latest eco-friendly festival armed with dedicated Earth Warriors to keep the beautiful bushland as pristine as they found it. Lost Paradise features a plethora of artists from around Australia including Tash Sultana and Peking Duk, as well as UK festival favourites The Kooks and M.I.A – just to name a few! Kicking off the party the only way they know how, the Red Bull Music crew will be in full swing on Friday 28 December with local and international artists descending upon the Lost Disco stage to bring the revelry. A colourful celebration of the year that was, the ethos of this home-grown carnavale is providing a space for everyone to unwind with a kaleidoscope of experiences. The forest backdrop plays host to a series of talks, yoga workshops and an Indigenous culture space with immersive activities connecting festival goers with the sacred land on which its held. For those wanting to get the party started, the Barcadi El Coco Danceteria is armed with the likes of Winston Surfshirt (DJ Set) and CC:DISCO! – amongst many more day-to-night festivities. Located in Victoria’s picturesque Gippsland region, the Beyond the Valley music festival will run from 28 December to 1 January. It’s a lineup of hip hop, electronic, dance and techno, featuring The Presets, Little Dragon, San Cisco and many more. As well as bars and food trucks, morning yoga classes and camping are included. $169 per person; glamping available at an extra cost. A Midsummer Night’s Eve, part of Hobart’s week-long Taste of Tasmania (28 December – 3 January), is a fabulous way to end the year on a high note. With headline act The Whitlams and fireworks, the event will boast around 70 stallholders showcasing the state’s finest seafood, cheese, wine and other yummy produce. And littlies will love ‘Kids in the Park’ featuring a silent disco. For a vantage point away from the parties, anywhere on the foreshore of Lake Burley Griffin was made to witness the fireworks. as they were launched over the lake. Commonwealth Park and Kings Park were just a couple of options to keep at front of mind. Rotto’s Thomson Bay, with its turquoise waters and sugar-white sand, is a popular place for families to gather on New Year’s Eve. There’ll be live music, glow-in-the-dark face painting, a photo booth, sand art and more. Fireworks will go off at 9pm, with additional ferries scheduled to get people back to the mainland (25 minutes to Fremantle or 90 minutes to Perth), or stay on the island and wake up to 2018 in paradise. Darwin’s waterfront is a lively place any time of year, but on New Year’s Eve it’s awash with festivity including a free outdoor concert and fireworks at 9pm and midnight. Top New Year’s Even in the Top End: Darwin’s waterfront is the place to be come midnight. There’ll be PAW Patrol shows, face glitter and balloon art for the kids, and food stalls and surrounding retailers will trade for dinner. Or bring a picnic and relax on the grass with your nearest and dearest. Start your New Year’s resolution early at Gwinganna Lifestyle Retreat’s New Year Detox (27 December – 3 January), a week-long program that will leave you rested and energised. From $3485 including organic meals, two massages and a facial, and fun activities, this will be a New Year’s Eve your body will thank you for. Fancy starting the year in the heart of Australia? Intrepid Travel’s three-day Uluru Adventure camping tour spends New Year’s Eve at either Uluru (30 December departure) or Kings Canyon (31 December departure). Tough choice, eh? Both tours follow the same itinerary, including a visit to the gigantic boulders of Kata Tjuta, and start from $695. Paddle your way into 2019 along the Brisbane River as the city skyline starts to glitter. Paddle in 2018 with a Riverlife illuminated kayak tour along the Brisbane River. Starting at 8:30pm, the Riverlife illuminated kayaking tour will be followed by a buffet barbecue with dessert, beverages, music and dancing, and a front row position for the midnight fireworks. Tickets are $125 per person. There’s nothing like a bout of fresh alpine air to get you motivated for a new year. AusWalk’s seven-day Roof of Australia self-guided walk is available over the New Year, an ideal time to explore the country’s highest alpine ski area by foot. The walk takes you along rivers, into undulating valleys and past fields of vibrant wildflowers and breathtaking mountain views. From $2355, including accommodation, most meals, chairlift rides, National Park fees and luggage transfers so you only need to carry a daypack.